When Mercedes returned to GP racing - in the mid-1950s - they did so in unforgettable style! They would only be back for a couple of years - but in '54 and '55, the W196 decimated all comers. Not surprising, really ... they had Juan Manuel Fangio and Stirling Moss driving for them! Behind the wheel of a W196, both men were in their element. Masters of their craft, now they had machinery to match! But there was more to the W196, even than Fangio and Moss. Engineer Rudolph Uhlenhaut was also at the peak of his powers. While his rivals were treading water technically, Uhlenhaut designed a car like no other! Extreme streamlining was the key. Included in that were the wheels - originally, fully enclosed. Handling, though, was wayward, when the car on the limit. So, Uhlenhaut uncovered the wheels ... and the W196 was back to its sure-footed best! Fangio won first time out in the W196 - at the '54 French GP. He did not know it, but he was already on his way to a second driver's title. There were just two occasions on which the W196 did not win that season. '55 was more of the same - except this time there was but a single race the W196 did not win! Fangio took a third title. Uhlenhaut had produced a car packed with cutting edge spec. The straight eight engine was rotated for a lower centre of gravity. Its valve-gear was 'desmodromic' ... look, Ma, no springs! And it was fuel-injected - almost a decade before that became de rigueur in GP racing. 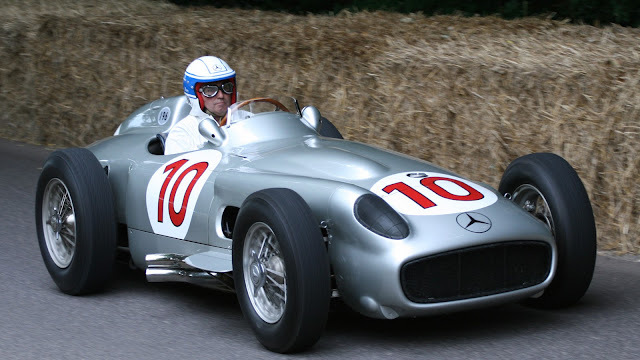 A consummately-crafted race-car, the Mercedes-Benz W196 was a fruitful marriage of man and machine.